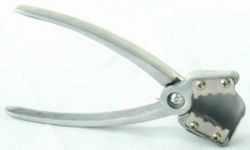 This Nut Sheller / cracker is so easy to use. Just clip the ends and sides of the nut and perfect halves are produced. Ideal for cracking and shelling many types of nuts including brazil nuts, almonds, walnuts, and hazelnuts. Not recommended for black walnuts or macadamias. Features a removable shell deflector shield for indoor nut shelling without making a mess. This sheller works great on lobster and crab. Made from top quality steel jaws and aluminum grips for many years of use.